Awhile back, Miss Y and I tried out George Restaurant in Yaletown, which was an extension of Brix located above it on Homer. Well, they did away with George and renamed the whole thing Brix & Mortar (nice play on words). So instead of 2 separate restaurants, we now have one with the top level often being rented out for private events such as weddings. We decided to check out the "new" arrangement with Costanza and Elaine (for her birthday). 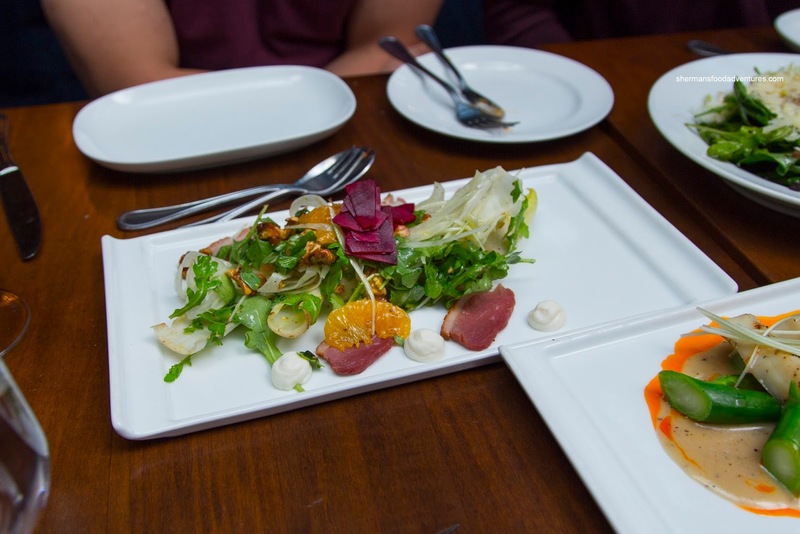 Starting us off was a couple of salads including the Orange & Fennel with smoked yogurt, house cured duck prosciutto, Banyuls vinaigrette and walnuts. This was a refreshing and lightly dressed concoction that was brightly crunchy. The sweet and acidic notes were balanced off by the salty prosciutto. The earthy beets added another level of tang while the yogurt was also tangy with a light smokiness. Next up was the Spinach & Rocket Salad with warmed truffle & bacon vinaigrette, focaccia crumble, frisée and poached free range egg. 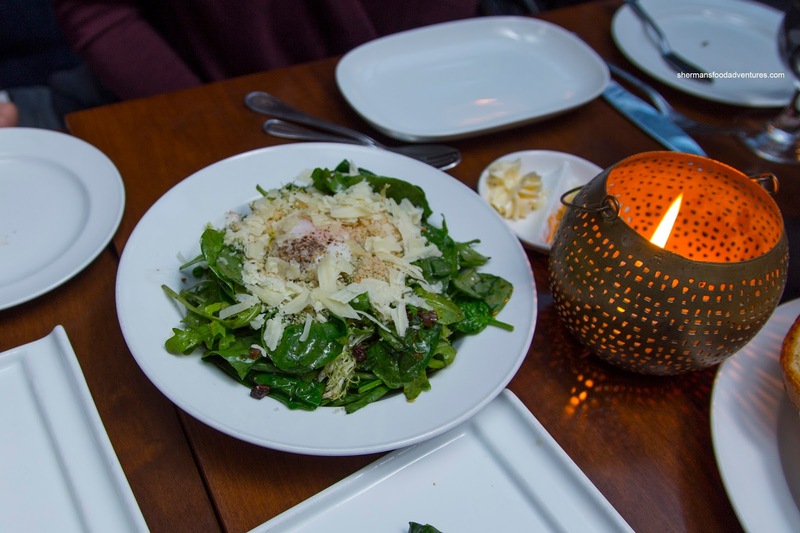 This was completely different in texture than the previous salad due to the wilted greens from the warm ingredients. The truffle was pretty strong while the bacon was meaty and salty. There was a hit of pepperiness to go with the very mild acidity. Loved the creamy egg as it caressed each leaf with a nice silkiness. 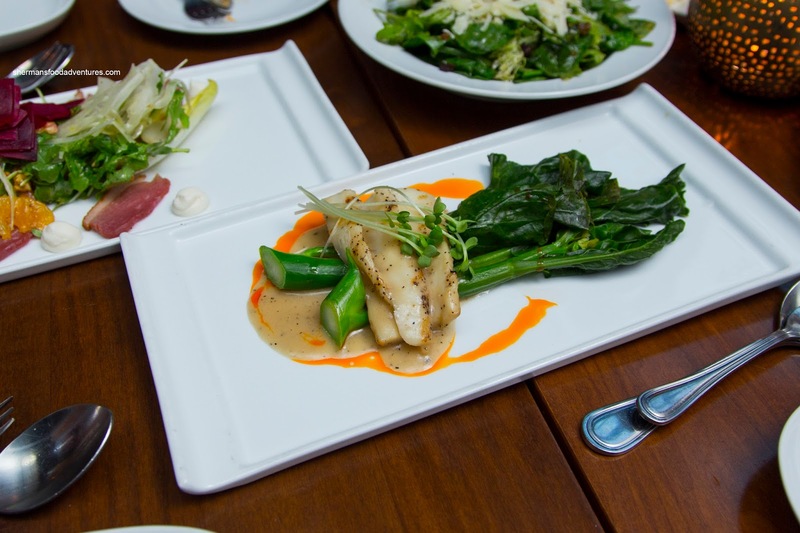 Onto my favourite appy, the Humboldt Squid was tossed in grilled & tossed with gai lan in a ginger soy glaze. Fairly large in size, the pieces of squid were tender with an appealing chewiness. There was a wonderful mouth-feel as I ate it. The glaze was savoury with a certain acidity and Earthiness. Lastly, it was accented by some spiciness. It was very complimentary without overwhelming the squid. Taking up much of the plate, the gai lan was crunchy and vibrant. 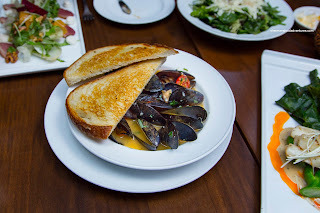 I wasn't a huge fan of the Fresh Steamed Mussels as they were pretty ordinary. They were very briny with a huge hit of the sea though. As for the broth, it consisted of white wine, house bacon, crushed chilies and cherry tomato. This sounded great, but in the end, all I tasted was pepper and tanginess. 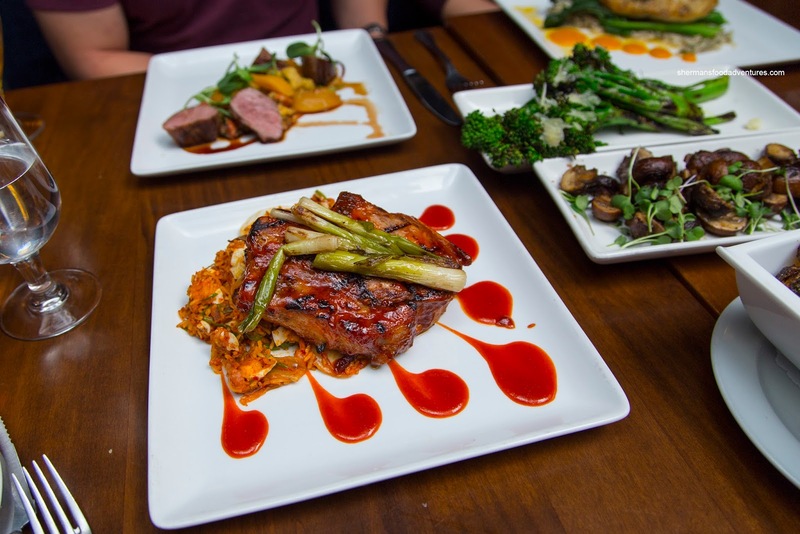 Onto our mains, I ended up with the best of the bunch with a sous-vide and subsequently grilled Gelderman Farms Pork Chop with Korean barbeque marinade, kimchi fried rice and grilled scallions. Due to its preparation, the pork was super moist and succulent. Usually, anything sous-vide can have a "boiled" quality, but this was not as the balanced sear on the outside helped build flavour and caramelization. The spicy gochujang was a nice compliment while the kimchi fried rice was a little soggy. It wasn't devoid of flavour though as it was loaded with tangy and richly spiced kimchi. 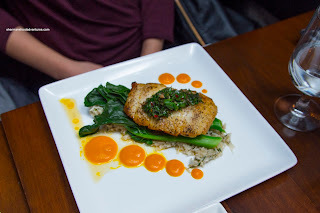 Elaine had our least favourite dish with the Vancouver Island Ling Cod with fresh torn herb rice, carrot & ginger purée and coarse chimmichurri. There wasn't anything inherently wrong with the preparation as the fish was flaky and soft, but there was a lack of impact, even from the list of ingredients. 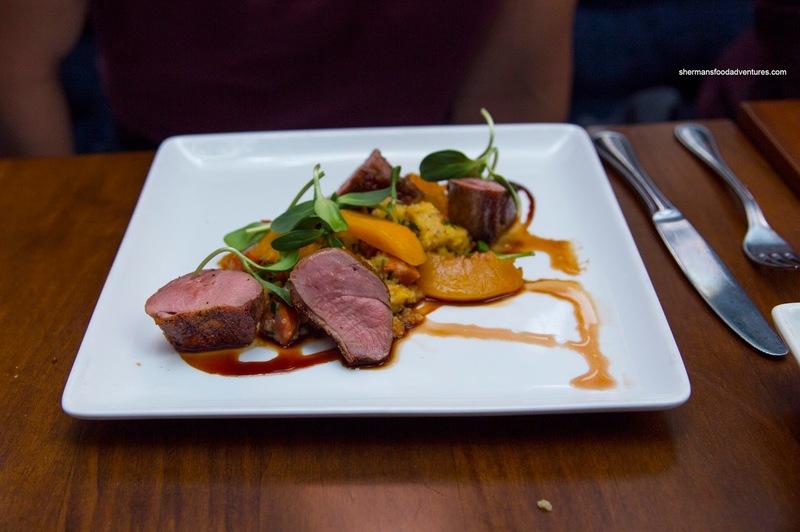 Costanza went for the Brome Lake Duck Breast brushed with Sorghum and accompanied by chorizo sausage & cornbread sauté and juniper pickled peaches. This was my second favourite item partly due to my love for duck. It was prepared properly though being medium. It was tender and mildly seasoned with the benefit from the savoury sausage and tart peaches. 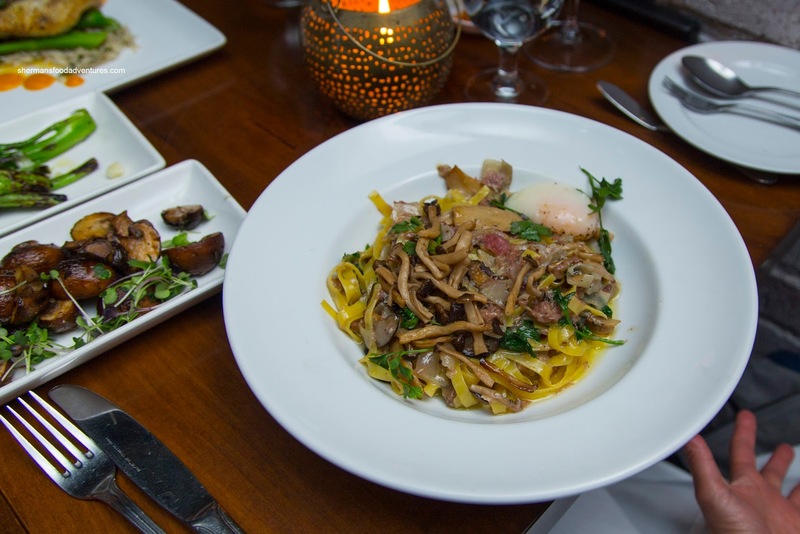 Having something a bit different than the rest of us, Viv had the Pork Cheek Tagliatelle with Gelderman Farms confit pork cheek and garlic with poached egg & pickled shimeji. This was fairly creamy pasta with a definite garlic hit as well as the light tartness of the mushrooms. I found the pasta to be fairly al dente while the modest amount of pork cheek was a touch dry. 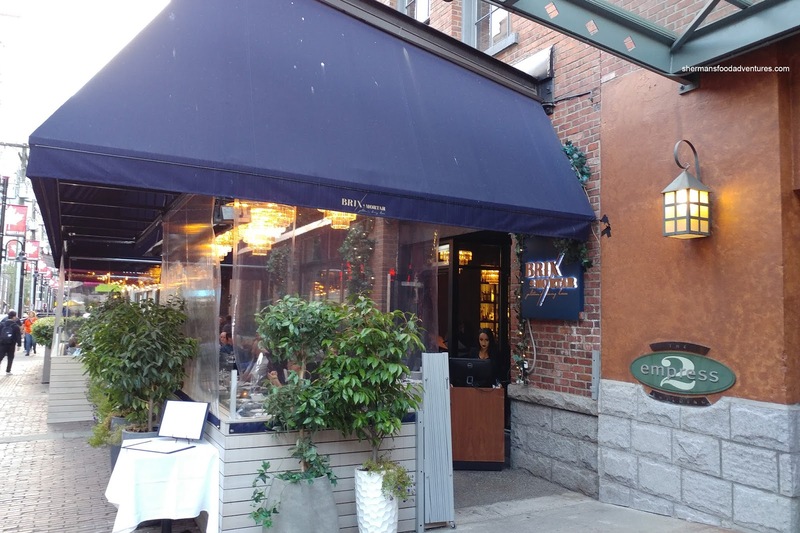 Considering its location in Yaletown combined with fairly well-executed eats, the prices at Brix & Mortar are quite reasonable. I would come back.